Let the adorable Enchantimals dolls and their animal friends enchant you. This lovable Tiger doll shares a special bond with her animal Tiger friend -- they're always together, and they look alike, too! the six-inch doll wears an outfit and shoes with bright colors, whimsical print, and furry touches. Animal-inspired ears Poke from her rooted hair to finish the look. Her Tiger friend has cute touches of its own. Kids will love recreating the special bond the friends share and celebrating a world where caring is our everything. Collect them all to build out a world of Enchantimals and tell enchanting stories of your own. 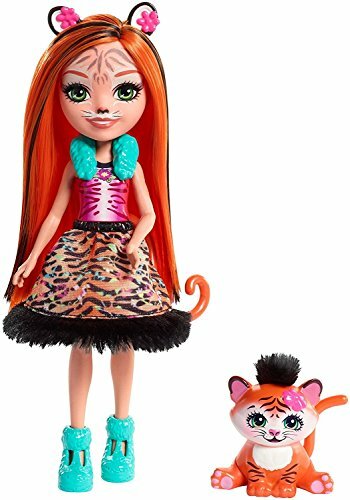 Includes one Enchantimals doll wearing fashion and accessories and one animal friend. Colors and decorations may vary.